Smarterra, based out of T-Hub, helps track and predict failures in water distribution to improve operational efficiency and improve environmental and citizen service outcomes. Six hundred people in India face high to extreme water stress, according to a Niti Aayog report. India ranks 120th amongst 122 countries in the water quality index and 70% of its water is contaminated. Even at a time when water is a scarce resource, cities like Bengaluru and Hyderabad have Non-Revenue Water (NRW) of about 30%–40%. This is water that is either being lost in leaks in the water supply network or is being tapped off illegally. As a result, water, which is already scarce in these cities, is being wasted. Given the scarcity of water and limited available resources, the government too has acknowledged that sustainable management of water resources is of ‘critical importance’. Realising this challenge, Hyderabad-based Gokul Krishna saw the need for a solution to help municipalities manage their water supply network – right from the operations of a treatment plant to managing the distribution network, maintaining it and the various components of this vast network. “Quite a lot of the smaller cities and towns haven’t even transitioned from data gathering using pen and paper. The data is meticulously collected but in paper registers and there is no way that this data can be analysed immediately to help decision-making. None of this data is available to citizens to ensure transparency and equitable service,” Gokul says. In order to address the challenge of towns and municipalities in India needing a solution to manage their water supply Gokul founded Smartterra. “Say a collector wants to know how much water was supplied to a particular neighbourhood – what was the demand-supply gap, what were the complaints, what were the maintenance issues and what the challenges are, we are building a water management platform to digitalise all information in terms of operations, maintenance and quality,” he adds. Smartterra is a platform with advanced geospatial intelligence for municipalities to manage the full cycle of water distribution. It helps track maintenance and predict failures to improve operational efficiency while improving environmental and citizen service outcomes. 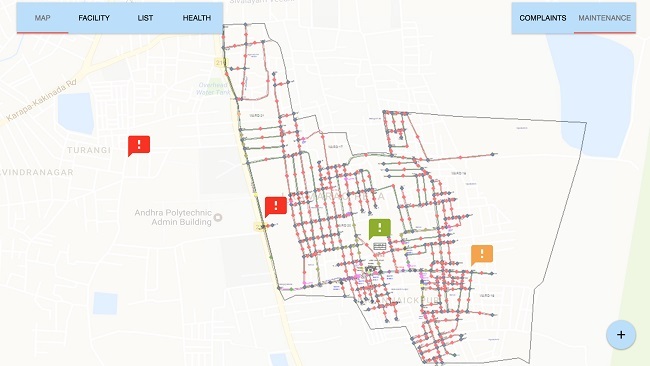 The startup, which is part of Hyderabad-based startup engine T-Hub's flagship Lab 32 program, is building a cloud-based model with water network-related demographic and geospatial details of the town, where all the data coming in from the field doesn’t sit in the system but gives comprehensive analyses and information, by the metre. It has three apps. One is AquaTasks, which maintains tasks and citizen complaints overlaid on the water and drainage networks. 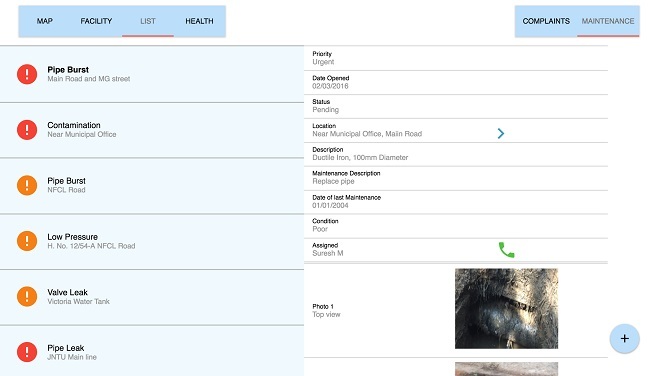 Maintenance resources, workers and expenses can be tracked and managed through this app. It also constantly tracks and analyses network health and helps the municipality reduce maintenance costs, predict network breakdowns and extend the life of the infrastructure. AquaPro is for municipalities to log daily operational details such as quantity of pumped/stored water, water quality tests, water tankers dispatched and so on, with a dashboard for visualising the data. It also stores historical tracking/analysis of operations to root out inefficiencies. It essentially helps the municipality lessen NRW, reduce downtime and ensure water quality. While Smartterra has sensors that can be mounted on connected metres to directly relay the information, data from offline metres can also be logged in manually into the app to help make sense of the data. AquaSmart is a publicly accessible published network analysis, such as daily water supply vs demand, current and future distribution of water/sewage connections in the city, sources of urban water body pollution, and infrastructure enhancement. It helps with analysis for city decision-makers and service summaries for citizens. Apart from municipalities, Smartterra also plans to work on water processes in commercial and residential buildings in terms of helping them manage their water networks. The startup is still in the pilot stage and will be running its first pilot in Sircilla district in Telangana, which will be followed by Warangal and Karimnagar. It recently won the ‘Urban Drinking Water Challenge’ (UDWC), a global innovation competition that commits up to $1,000,000 to startups to deploy and invest in scalable water solutions. The funds, Gokul says, gave Smartterra a deployment grant, allowing it to implement the product in a few cities. The long-term goal for Smartterra is to become the go-to urban water management solution. In 2-3 years, it wants to expand to 50 cities and towns and in a few 100 commercial buildings such as malls. “The Indian situation is very unique. We have intermittent water supply, it’s not continuous. In 2-3 years, urban India will be even more water stressed and the quality and quantity of water will be low. Hence, we will need more and more managerial expertise for water and that’s what we’re building. The need of the hour is to make water utility smart and we want to be the water experts helping you do just that,” Gokul says.